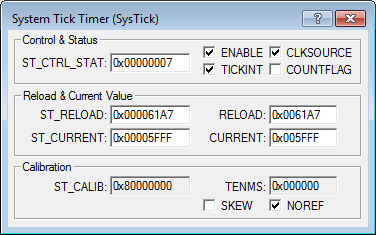 The System Tick Timer (SysTick) dialog (for Cortex-M3, Cortex-M4, and Cortex-M7) shows controls for the system timer. The system timer is an optional feature. If not implemented, then the SysTick registers are reserved. When enabled, the system timer counts down from the ST_RELOAD value to zero, then reloads (wraps) the value on the next clock edge and decrements on subsequent clock cycles. As an RTOS tick timer that fires at a programmable rate, such as 100Hz, and invokes a SysTick routine. As a high speed alarm timer using the main processor clock. As a variable rate alarm or signal timer. The available duration range depends on the reference clock used and the dynamic range of the counter. As a simple counter. Software can use this to measure time to completion and time used. As an internal clock source control based on missing or meeting durations. Software can use the COUNTFLAG field in the control and status register to determine whether an action completed within a particular duration, as part of a dynamic clock management control loop. Shows the SysTick Control and Status Register (SYST_CSR) settings. ST_CTRL_STAT Shows the content of the SYST_CSR register (in HEX) located at memory address 0xE000E010. Reset value is 0x00000000, or 0x00000004 if your device does not implement a reference clock. 0 (unchecked) = counter disabled. 1 (checked) = counter enabled. 0 = counting down to zero does not assert the SysTick exception request. 1 = counting down to zero asserts the SysTick exception request. Changing the value of the counter to 0 by writing zero to the SysTick Current Value register to 0 never changes the status of the SysTick exception. 0 (unchecked) = external reference clock. 1 (checked) = processor clock. If your device does not implement a reference clock, this bit reads-as-one and ignores writes. COUNTFLAG Returns 1 if timer counted to 0 since the last read of this register. Reading to the SYST_CSR register or COUNTFLAG bit, sets the value to 0. Writing to ST_CURRENT also sets COUNTFLAG to 0. A write to ST_CURRENT does not trigger the SysTick exception logic. A click in and out of this field triggers a write to the register and sets the value to 0x0. Shows the content of the SysTick Reload Value Register (SYST_RVR) and SysTick Current Value Register (SYST_CVR). ST_RELOAD Holds the value to load into the SYST_CVR when the counter is enabled and when it reaches 0. Represents the full content of the SYS_RVR register in Hex located at address 0xE000E014. Bits [31:24] are reserved and are read-as-zero. The value is in the range 0x00000001-0x00FFFFFF. You can program a value of 0, but this has no effect because the SysTick exception request and COUNTFLAG are activated only when counting from 1 to 0. RELOAD Shows the significant bits of ST_RELOAD. ST_CURRENT Contains the current value of the SysTick counter. This control shows the full content of the SYS_CVR register in Hex located at 0xE000E018. Bits [31:24] are reserved and are read-as-zero. Any write to the register clears the register to 0. It also sets COUNTFLAG to zero. CURRENT Shows the significant bits of ST_CURRENT. Sows the content of the SysTick Calibration Value Register (SYST_CALIB). The reset value of this register is IMPLEMENTATION-DEFINED. ST_CALIB Shows the full content of the SYST_CALIB register in Hex located at address 0xE000E01C. TENMS Reload value for 10ms (100Hz) timing, subject to system clock skew errors. If the value reads as zero, then the calibration value is not known. 1 = TENMS value is inexact, or not given. An inexact TENMS value can affect the suitability of SysTick as a software real time clock. 0 = reference clock provided. 1 = no reference clock provided. If your device does not provide a reference clock, then the CLKSOURCE bit reads-as-one and ignores writes. Refer to Systick Timer (SYSTICK) for available functions in CMSIS.